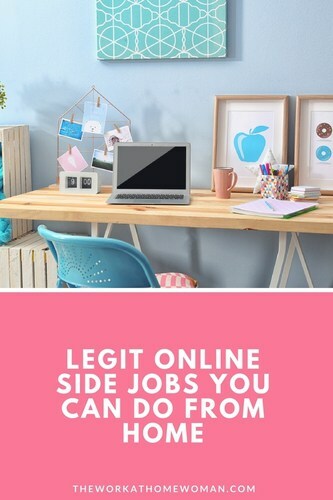 Whether you have a full-time job, part-time job, or you are a stay-at-home mom, a great way to supplement your income is by finding a legit side job. An online side job, otherwise known as a side hustle, can be any type of paid work you complete. Most online side jobs allow you more freedom than having a second job because they are flexible and can pay you per job instead of by the hour. Plus, the only requirements are a computer, internet service, and often times a telephone. The only problem that arises when finding an online side job is finding jobs that are legit. There are a ton of spammy sites and scams on the internet especially when it comes to finding paid work. Many sites will promise you a high amount of money, but the work you are doing is not what they describe on their site. For example, I have come across numerous rebate processing jobs that sound amazingly easy to complete with a large amount of money. Every single one of these jobs that I have looked into consisted of you selling a service and trying to get people to sign-up so that you got paid. You do not actually process any rebates. These are the kinds of jobs that you need to beware of when it comes to finding paid work online. After searching for good online side jobs, I have found a select few that are legit. Below you will find a list of legit online side jobs along with where you can look for open positions. Writers are in huge demand. Many websites and blog owners do not have the resources to create new content, so they need to outsource it to freelancers. If you are an expert in a particular or subject or have good writing skills, you can check these sites and apply for job openings: Upwork and Guru. See this post for more freelance writing jobs. Tasks can include scheduling, social media management, administrative duties, bookkeeping, etc. Depending on your schedule many virtual assistant jobs can be both part-time or full-time and can be done when it fits into your schedule. Virtual Assistant jobs can have a wide range of people who will hire you. To find work you can search blogs, check your local job posting sites, Indeed, and FlexJobs. For this side job you definitely need to have the experience needed to complete graphic design work. Starting out as a freelancer is the perfect way to start your career while still working as many hours as you desire. Some of the best places to find work online for graphic designers include Coroflot and Authentic Jobs. This online side job normally entails you answering questions, helping customers with a problem or complaint, and general product information. Most customer service representatives who work from home do need to work set hours and shifts. This side job does not have as much flexibility, but you can do it from the comfort of your home. You can find customer service representative jobs on Working Solutions or even search at home customer service representative. A lot of companies will have this type of position listed on their own personal job boards. This is one area where you need to be careful. There are a lot of websites and companies who are looking to have people enter data into their software systems. The best part of these jobs is the work is easy, and you do not need to have a lot of experience to get hired. But make sure to watch out for the companies that only pay pennies per document and that have hyped-up ads. If you are seeking a data entry job that you can do from home take a look at VirtualBee or Dell, who hires Data Entry Operators. Make sure you take the time to properly research any company before divulging personal information or accepting a position. If they seem “too good to be true,” more than likely they are. Even though there are a lot of scams online, you can still find legit work from home jobs that you can complete in your spare time. What side jobs have you done? Addi Ganley is a full-time blogger and writer at Frugal Fanatic, where she offers a fresh perspective on frugal living and provides various options to earn an income. She focuses on how to make money either full-time or part-time and teaches people about money management on a tight budget. I am a stay-at-home mother of two little girls. In order to be able to work from home, I needed something that was flexible. You open up slots according to what times you are available to teach. Students then can book you for those time slots. YOU CONTROL YOUR SCHEDULE. Also, the slots are available from 7pm- 7am MST. I work before my kids are awake or after they go to bed. If you have any questions please feel free to email me @ Katherine.b.ashby@gmail.com and I will get back to you! I’m glad you found an opportunity that you can do from home! I would like more info on how to get started with some of these jobs please? Another new way to earn cash is to register on to http://www.HelpingNeighbor.com to receive email alerts on the jobs you would like to work in the areas you would like to work in. There you can also sign up to receive commission for all the referrals you get for each time a referral creates a job that gets paid. Awesome deal!! I’m not sure — you would have to check out each site individually. It’s so nice to find another source with credible online work resources. I have shared this with my sister who is currently looking for work and is considering working from home. Yes, Corina has a great work from home site as well. She is amazing, isn’t she? Glad you enjoyed it, Irish! Thanks for spreading the word — appreciate it. Happy NY! Corina, what other gigs have you done? Ladies — Corina has a great WAH blog too, check it out! Thanks for sharing these ideas with us. I’ve been with virual bee since 2009. I wasn’t making a lot of money but the money I did make came in handy when I needed it. Gladly sharing this on social media. Have a great day and Happy New Year! Thats great that you have been with them for that long.